The big picture is the most evident thing here, but the finer details are there too, admirably scaled and presented in their proper time and place. A delightful listen! It's great that valve audio equipment continues to be produced and at attractive prices, too. 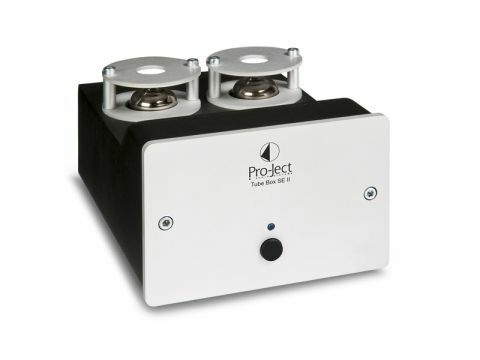 Pro-Ject is to be commended on managing to squeeze a couple of small-signal valves (12AX7, since you ask) into its delightful 'Box Series' and on keeping things affordable at the same time. This isn't a pure valve amplifier, though, as op-amps assist along the way and, in fact, most of the non-valve parts are modern surface-mounted types. Gain is sensibly set at 40 and 60dB for MM and MC respectively, while the maximum output is higher than most at ten volts, giving a very good degree of headroom. Gain is selected by a push switch at the rear, while another one switches a rumble filter in or out. Loading (both resistance and capacitance) is adjustable by using the provided jumpers on terminals at the rear. This seemed to be the most consistent of the group between the two cartridge types, with a discernible character – and a likeable one at that. The sound is detailed, extended at both frequency extremes and well controlled and imaged. But above all that it is very much 'of a piece', in a way that not all audio equipment seems to manage. Everything is kept in utterly plausible relation to everything else in the mix (always assuming a good LP, of course) and the result is some very solid and 'present' musicians right in front of you. We felt as strongly with vintage recordings of classical symphonies, as with more recent audiophile jazz cuts, so overall this is a very convincing and persuasive bit of kit.